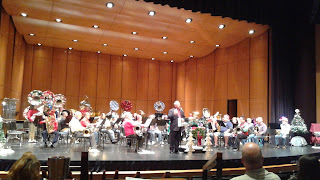 Friday night Dave and I attended the 3rd Annual TubaChristmas at the University of Mount Union. Full disclosure, I'm a 2012 University of Mount Union alumna and I enjoyed four wonderful years as a member of the Purple Raider Marching Band and as a concert oboe. I found out about this event via Facebook, since many of my mutual former band friends were invited. Although I may be slightly biased towards my alma mater and former band, I think we can all get behind a free musical event during the holidays (I should mention that it's free to attend, to participate there is a fee). When Dave and I arrived on campus we were impressed how many community members were in attendance to enjoy the concert. The audience spanned a wide range of demographics -- there were families in attendance with small children, college students, and elderly couples. The tradition of TubaChristmas started on December 22, 1974 at New York City's Rockefeller Center. 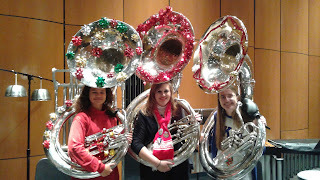 Since that day cities around the world have hosted TubaChristmas events bringing tuba and euphonium players from all over the area to participate. The TubaChristmas event at The University of Mount Union started three years ago when the newest band director Dr. Otis French suggested that the band start hosting one of his favorite events. Now, the event is run entirely by the students who are members of the national honorary band fraternity Kappa Kappa Psi and the TubaChristmas event last night was the largest that has been hosted on campus. 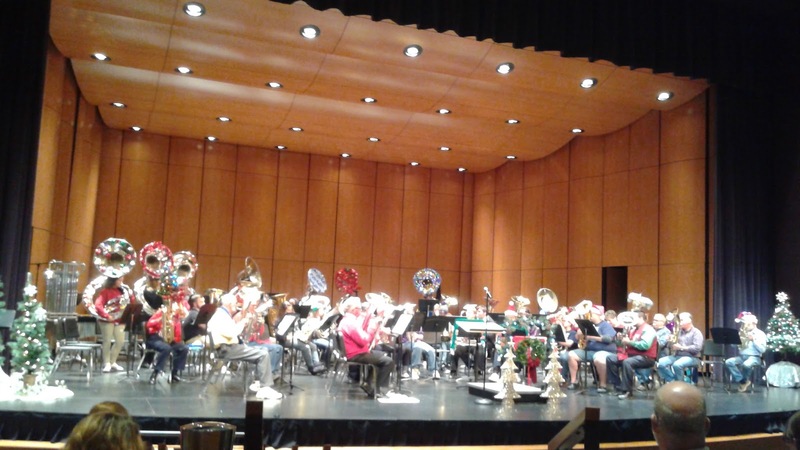 Tuba players from the community and surrounding area are invited to attend an hour long rehearsal of popular Christmas carols. 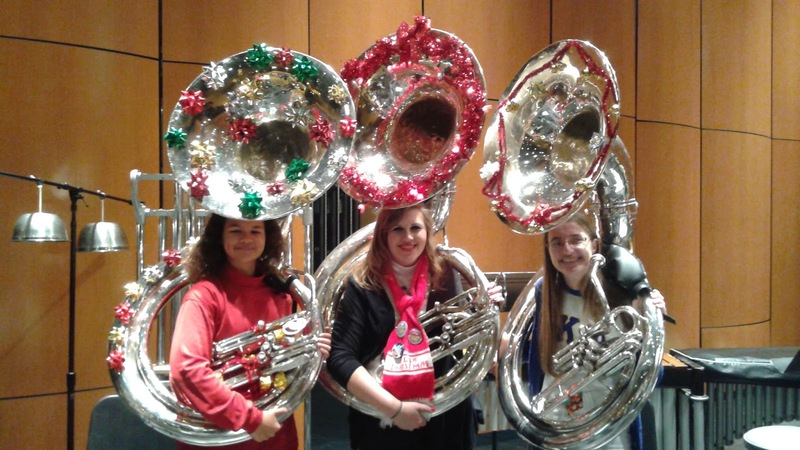 They are also highly encouraged to decorate their tubas to fit with the Christmas theme. After rehearsal there is a free concert with the tubas playing through the Christmas carols with the audience joining in for a sing-a-long during the second verse. 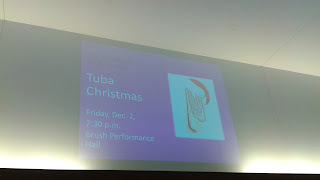 Although TubaChristmas events usually take place outside, the event at the University of Mount Union was inside the brand new Brush Performance Hall. Unfortunately, I only had my cell phone to take pictures, my camera has much better zoom. Songs included: Deck The Halls; Good King Wenceslas; and Joy to the World among others. It's also tradition at TubaChristmas events to give out several awards to participants who have met certain criteria. 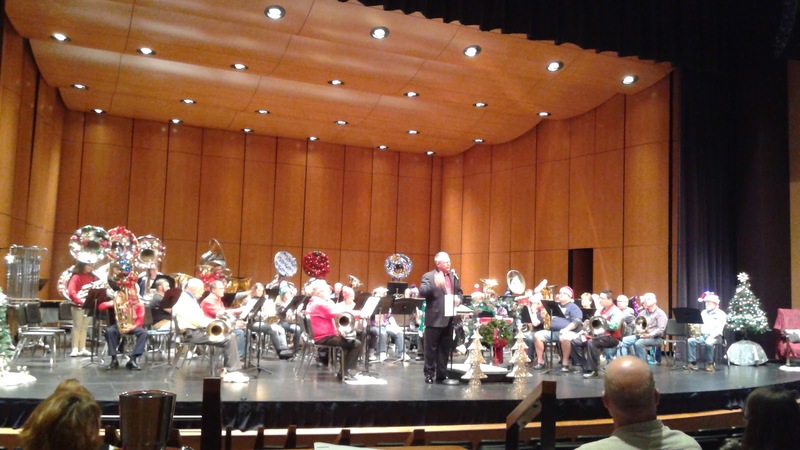 At Mount Union's TubaChristmas event last night the oldest player was 88 years old, the youngest player was 11 years old. A woman named Lindy won the award for participating in the most TubaChristmas events, she had participated in 37. The furthest traveler last night was a Mount Union alumni who traveled 60 miles to play in this particular TubaChristmas. There were Tubas with bows, light displays, and mini Christmas trees. 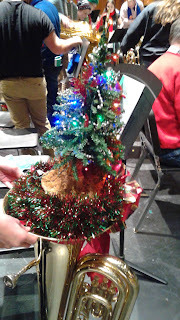 The tuba below won best decorated for the event. Thank you to Dr. Otis French and the members of Kappa Kappa Psi: Iota Lambda for hosting such a fun community event. Paula Kyser, on the far right, is currently President of Mount Union's Kappa Kappa Psi chapter and put a tremendous amount of work into organizing this event. 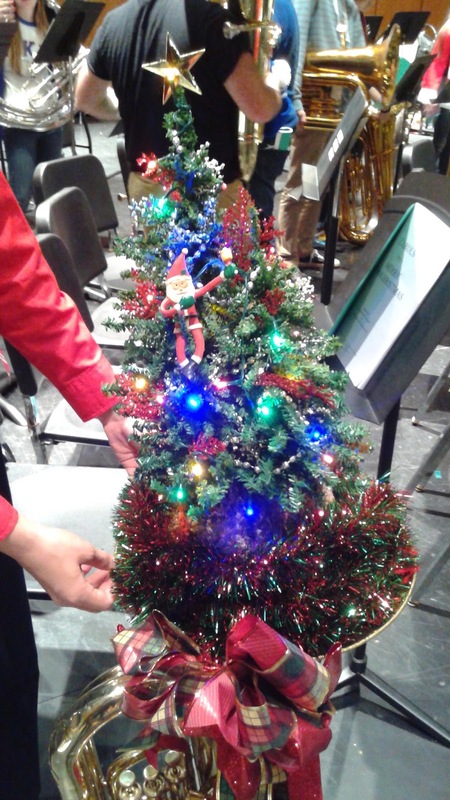 How cute are these sousaphones decorated for TubaChristmas?! Great job to these ladies who are members of Kappa Kappa Psi! Dave and I are excited to attend TubaChristmas at the University of Mount Union in the future to see how the event grows. 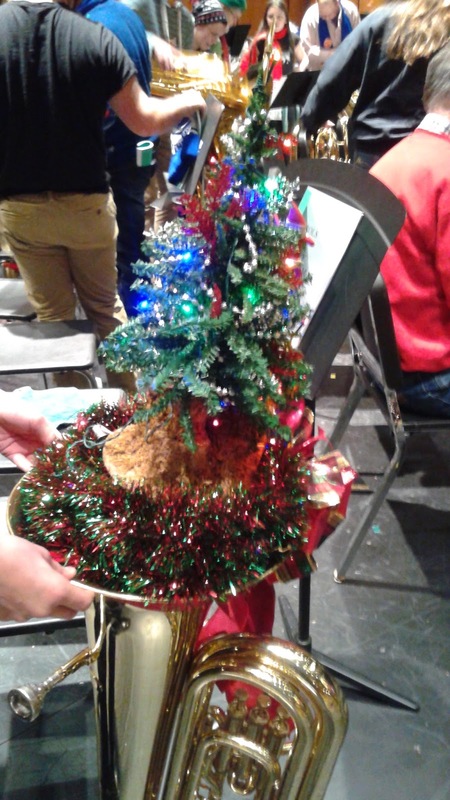 The holidays are such a busy time, but it was so much fun to sit down and enjoy TubaChristmas -- two of the best parts are that it's not a lengthy program and it's free! Last night we went to the sneak preview of That Christmas Bar a new pop-up bar hosted by TD's Tailgate Grill in Canton. We've never eaten at TD's Tailgate, but we do enjoy one of the other two restaurants in the area owned by the same owners -- Twisted Citrus. The owners got the idea from a Game of Thrones pop-up bar they visited in New York City (um, yes please). They then converted an extra room at TD's Tailgate in a Christmas extravaganza utilizing items from the Hartville Flea Market, garage sales, estate sales, and Goodwill (more on the decor and transformation from the Canton Repository). To be honest, I don't think either of us really felt like going out last night, but we had a blast starting from the moment we set foot in That Christmas Bar. This past weekend Dave and I went on a short hike in Sagamore Hills at Brandywine Falls. It was a sunny, but still chilly day, so before meeting up with his aunt and uncle for our dinner plans, we made a coffee detour. After a brief search of "coffee shops in Hudson" we decided to visit Caffe Gasperi, because I really liked the website. On the day we went to Caffe Gasperi, we were delighted to find out that owner of Gasperi, Laura, was the barista who served us. We arrived at Caffe Gasperi about an hour before closing, so there weren't too many baked goods left (which I like to see, that's a sign of success), but biscotti and scones were still available. The centerpiece of Caffe Gasperi is the Elektra Espresso machine. The Elektra at Caffe Gasperi is one of only five or six currently being used in American coffee shops. Most espresso machines are flat-fronted, but the Elektra's round design allows more than one person to work at a time. Last week I found out about this event that was going on at the Akron Zoo on Halloween. What does the Akron Zoo do with all of the pumpkins left over from Boo at the Zoo? They give them to the animals of course! I know it seems silly, do animals really want to play with pumpkins? The Akron Zoo uses various items throughout the year to pique their curiosity, engage their minds and encourage them to be more active. There is a little secret to getting the animals to play with their pumpkins though (they're full of treats). Animals were provided with their enrichment treats in half hour increments, giving you plenty of time to travel between exhibits after watching them enjoy their pumpkins. First on the agenda were the penguins. The penguins were given floating plastic jack-o-lanterns to play with in the pool. The penguins also had three penguin pumpkins, but they were pretty uninterested in those pumpkins.